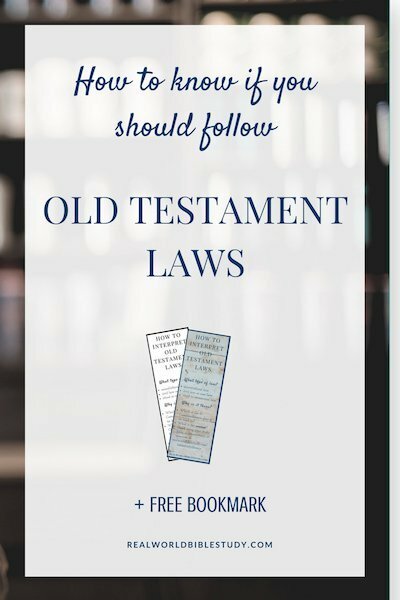 How do you know if you should follow Old Testament laws? Have you ever done one of those Bible in 1 Year reading plans? Raise your hand if you got stuck in Leviticus! Whenever we read those parts of the Old Testament, we often ask these questions: Why is this in the Bible? What does it mean for me? Should I follow these Old Testament laws? It’s easy to misinterpret the Old Testament, so these are really great questions to ask as you learn to interpret the Bible. Today I want to discuss that third question. How do we know if we should follow Old Testament laws? If we’ve spent a little time in church or done a little Bible study, we probably think we’re exempt from the food laws. Why? Because Peter was dreaming about food (Acts 10-11) and Jesus told him that the food God created was fair game. (Get it?) But how do we know about the other Old Testament laws? Moral laws are laws that “regulate human conduct” (Longman, How to Read Exodus); they tell us how to live. How do we interact with God and people? Think about the Ten Commandments: do not steal, do not murder. While some of the other Old Testament laws are also moral in nature, they all seem to tie back to the Ten Commandments as the foundational principles, and even the Ten Commandments tie back to what Jesus called the two greatest commandments: to love God (commandments 1-4) and love people (commandments 5-10). Ritual laws are applications of commandments 1-4 in the context of ancient Israel. 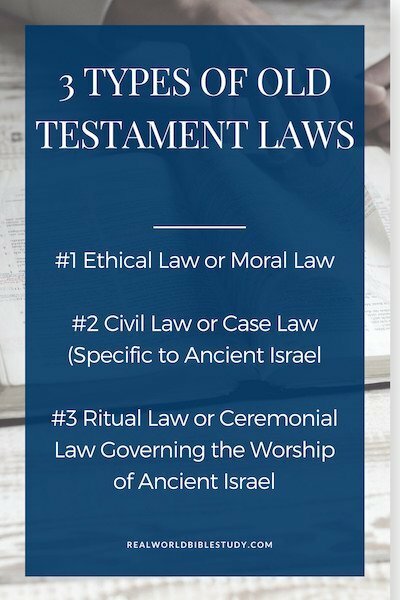 These are laws related to “the formal worship of Israel” (Longman, How to Read Exodus). An example would be Exodus 20:22-26, which gives instructions for building an altar. Old Testament laws are an important part of God’s word to us, because they reveal God’s story and God’s character (Stuart & Fee, How to 1). These laws were how ancient Israel demonstrated her loyalty to God in her context. But this particular covenant agreement was between God and ancient Israel, and he provided us a new covenant in the New Testament (it’s actually what “testament” means), which supersedes the old. So none of the Old Testament laws are binding for us today unless they are renewed in the New Testament (How to 1). It seems clear that the new covenant does not renew the civil laws (case laws) and ritual laws (ceremonial laws). Jesus’s work on the cross introduces the new way to worship and receive forgiveness, replacing the old ritual laws. As Stuart and Fee say, “when Jesus’ once-for-all sacrifice was accomplished…this old-covenant approach was immediately made obsolete” (How to 1). But some Old Testament laws do carry over to our new life with Jesus. The New Testament states these Old Testament Laws in various ways and ties them back to the Ten Commandments and in turn the two greatest commandments (for example, Matthew 5:21-48). Same principles, but sometimes a different application. Especially, Jesus seems to approach these laws in terms of love for God and love for neighbor rather than a list of rules and regulations to be kept (How to 1). God’s Word originally introduces the concept of Sabbath in the creation story. Remember? God worked for 6 days and then rested. The idea of Sabbath as law comes up in Exodus 16, and it is included in the Ten Commandments in Exodus 20. This is the principle: work for 6 days, but dedicate 1 day to rest and worship. Do your work for six days, but the seventh day should be holy to you, a Sabbath of complete rest for the Lord. Whoever does any work on the Sabbath will be put to death. Don’t start a fire in any of your homes on the Sabbath day. Check that out. Violating the Sabbath was a capital offense! So don’t let anyone judge you about eating or drinking or about a festival, a new moon observance, or sabbaths. These religious practices are only a shadow of what was coming—the body that cast the shadow is Christ. – Colossians 2:16-17, emphasis mine. Yet the principle of Sabbath is still relevant and important to us. 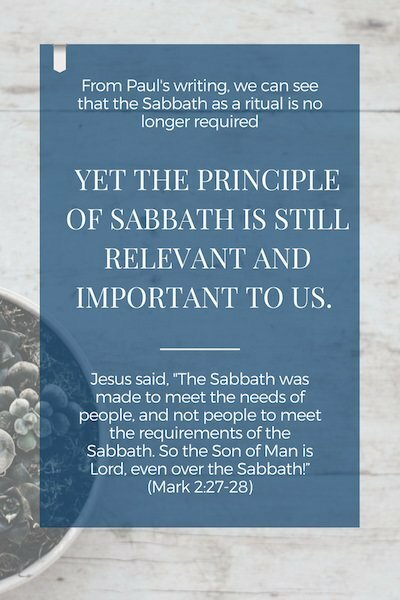 This is why Jesus, when healing on the Sabbath, doesn’t say that the Sabbath is null and void, but instead says that “The Sabbath was made to meet the needs of people, and not people to meet the requirements of the Sabbath. So the Son of Man is Lord, even over the Sabbath!” (Mark 2:27-28). The Sabbath as a spiritual discipline that God gave us to bless us and as a way to worship him is still important, even though the ritual practices and requirements of the Sabbath are no longer mandatory. What are some ways you can keep the Sabbath holy in your life today?